Chemotherapy burns produce erythema, which is a reddening of the skin. Along with pain, there may be large blisters, called bullae. The palms and the soles may be affected and the pain from this rash may be so severe that daily activities are limited. These symptoms can be preceded by dysaesthesia, or an altered sensation of the skin. Chemotherapy role is to damage rapidly dividing cells, the key trait of cancer cells. In the process of chemotherapy, healthy cells that are also rapidly dividing, such as skin cells, are also damaged. Because the chemical is widespread throughout the body, the damage to the skin may also be widespread. In contrast, radiation therapy damages only those skin cells that are in the path of the radiation beam. 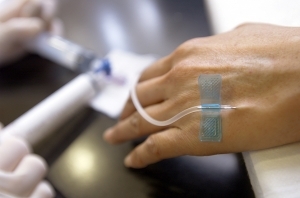 Supportive care for chemotherapy burns may include an analgesic (pain relief) and cold compress. Consult with your medical professional for the best course of action. Recovery by NeoGenesis is recommended after chemotherapy to help restore homeostasis in the skin and in the nail beds. Recovery is abundant in our patented S²RM® molecules. Apply Intensive Moisturizer after Recovery to help restore the barrier and provide much needed hydration to the skin. Simple topical application of these products should help mitigate redness, irritation, and pain. By applying these products to the cuticle and skin surrounding your nails, it may help to alleviate unsightly changes in the appearance of your nails.